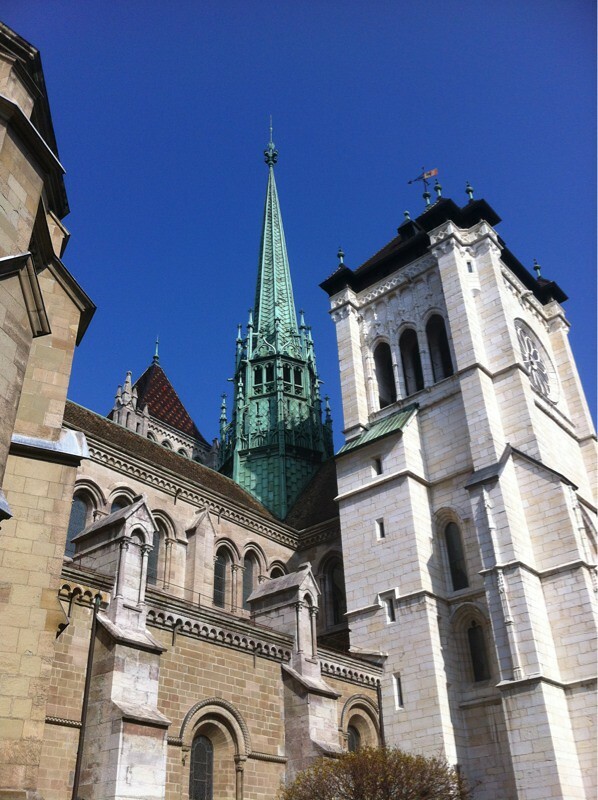 The Reformation in Geneva was not of the Lutheran type, but was based upon the teachings of Jean Calvin. In fact, Martin Luther was seen by Calvin as only beginning the Reformation. Some in the Reformed Church referred to Martin Luther as a half-papists, indicating that he retained too many Roman Catholic practices, such as vestments, liturgy, et al. The photo tour below does not represent the history of the Lutheran Church, but of the Reformed Church, which provides the theological foundation for most other Protestant Churches (Presbyterians, Anglicans, Methodists, Baptists, et al). 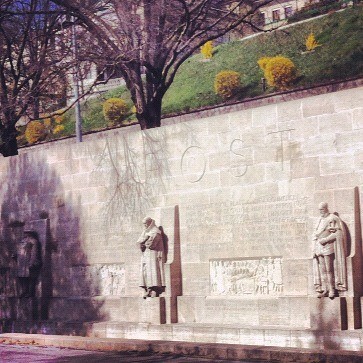 At the Mur des Réformateurs (Wall of the Reformation), William Farell, John Calvin, Theodore Beze, and John Knox are pictured at the center of the wall (pictured in top panel above). Off to the left when facing the Wall of the Reformation, a carved stone with Luther’s name appears. Off to the right when facing the Wall of the Reformation, a carved stone with Zwingli’s name appears. From the perspective of the Reformed Church, both Luther and Zwingli are given credit for beginning the Reformation. However, the Reformed Church does not believe Luther or Zwingli, properly reformed the church, hence the need for Calvin, Beze, and others. 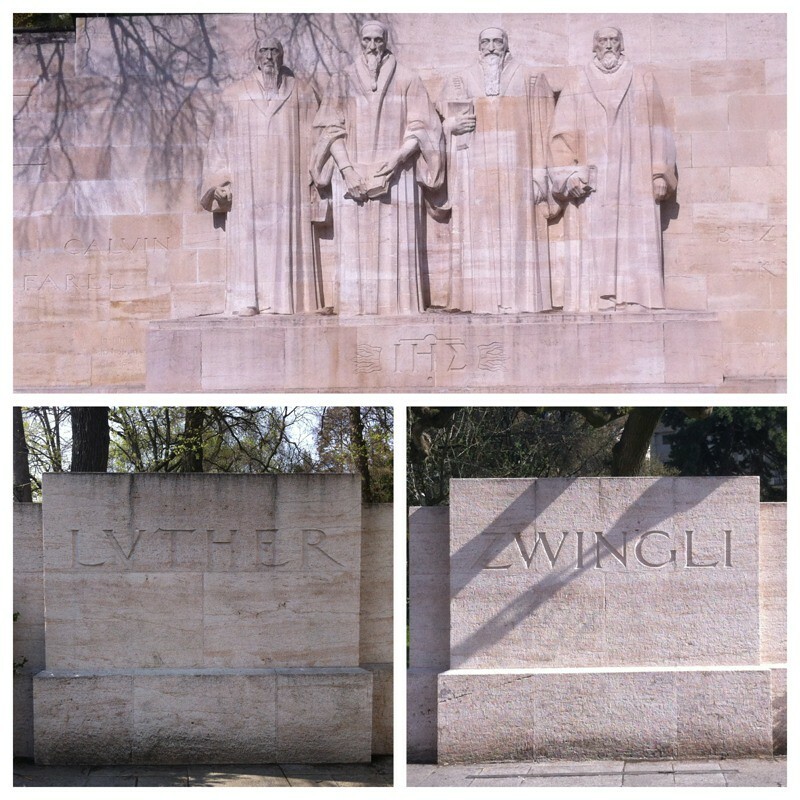 This is why Luther and Zwingli are represented by stones but not carved into the wall. the Reformation Wall was constructed in 1909 for the 400th birthday of Calvin. To the right (ordered from left to right) are 3 m-tall statues of: Roger Williams (1603 – 1684), Oliver Cromwell (1599 – 1657), Stephen Bocskay (1557 – 1607)? To the left (facing the Wall, ordered from left to right) of the central statues are 3 m-tall statues of: William the Silent (1533 – 1584), Gaspard de Coligny (1519 – 1572), Frederick William of Brandenburg (1620 – 1688). 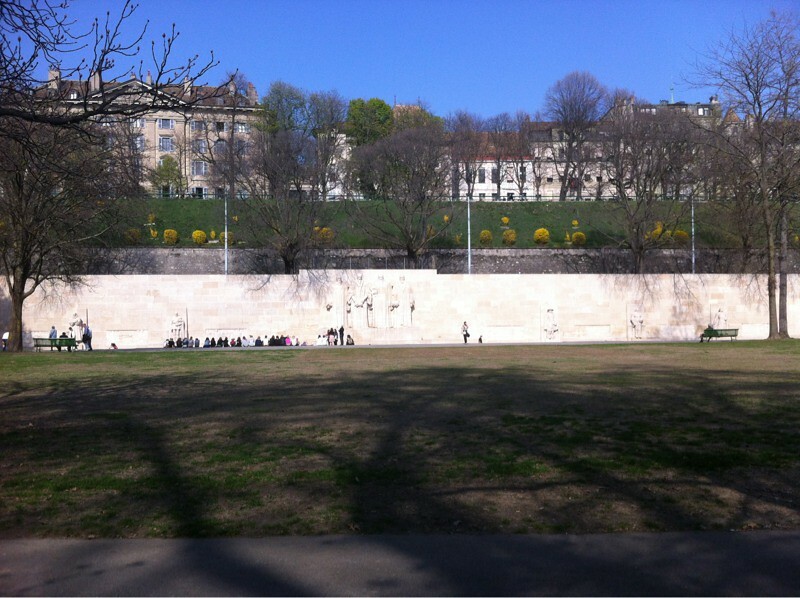 “The Wall is in the grounds of the University of Geneva, which was founded by John Calvin, and was built to commemorate the 400th anniversary of Calvin’s birth and the 350th anniversary of the university’s establishment. 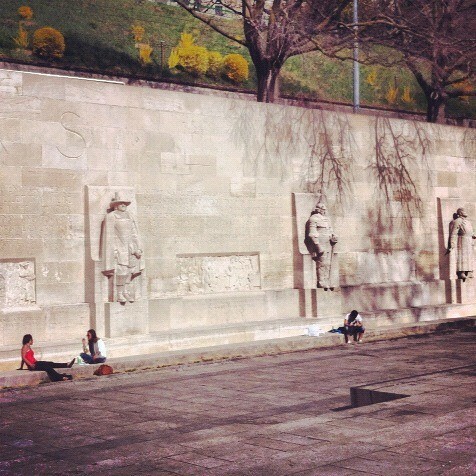 It is built into the old city walls of Geneva, and the monument’s location there is designed to represent the fortifications’, and therefore the city of Geneva’s, integral importance to the Reformation.” (From Wikipedia, http://bit.ly/Hnjk1r) The Reformation Wall is 100 meters long. Not too far from the Reformation Wall is St. Pierre Cathedral. 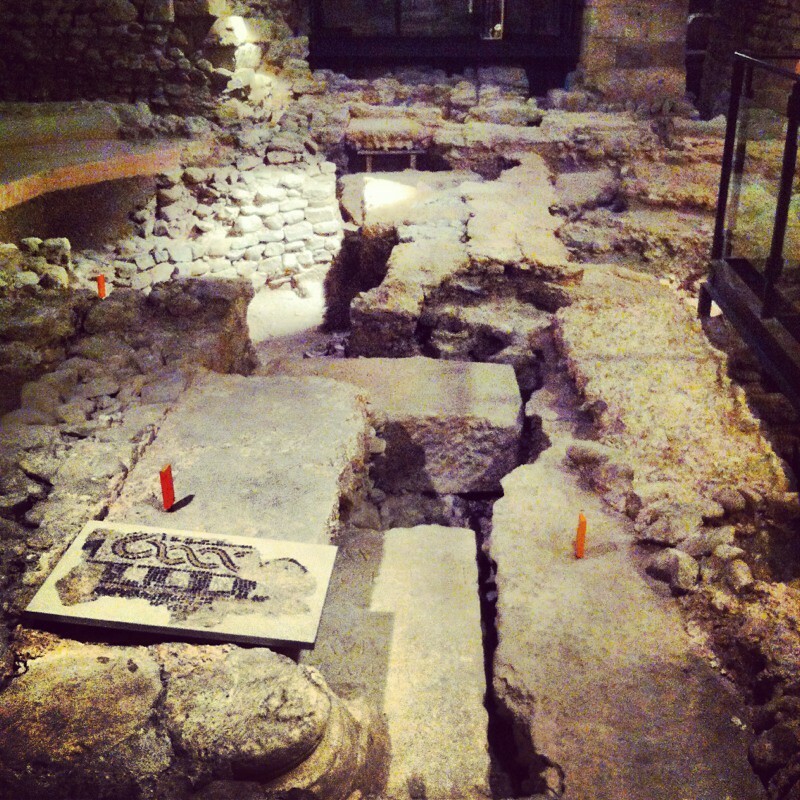 Before the Reformation, it was a Roman Catholic Cathedral whose origins date to the 4th century AD. The inside of the cathedral is rather stark. The pre-Reformation ornamentation is gone, “reformed” away under Jean Calvin’s instruction. Calvin preached here regularly until his death. Rev. 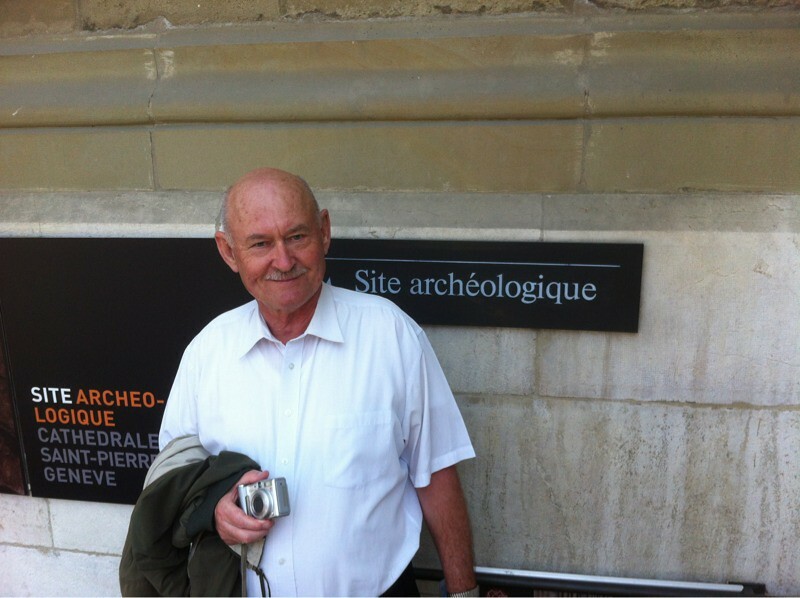 Ralph Mayan, President Emeritus of the Lutheran Church Canada (LCC) and interim-Executive Secretary for the International Lutheran Council (ILC) descends to the archeological dig beneath St. Pierre Cathedral. The Baptistry dates from the 6th century AD. 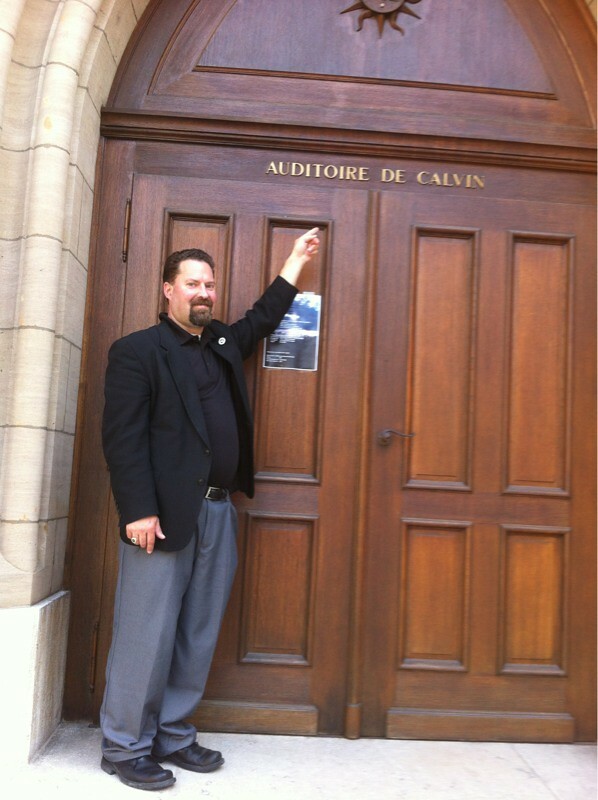 Dr. Collver stands outside the hall where Jean Calvin lectured. The marker identifies the location of the cathedral. The green area titled, “Les Bastions is the location of the Reformation Wall. 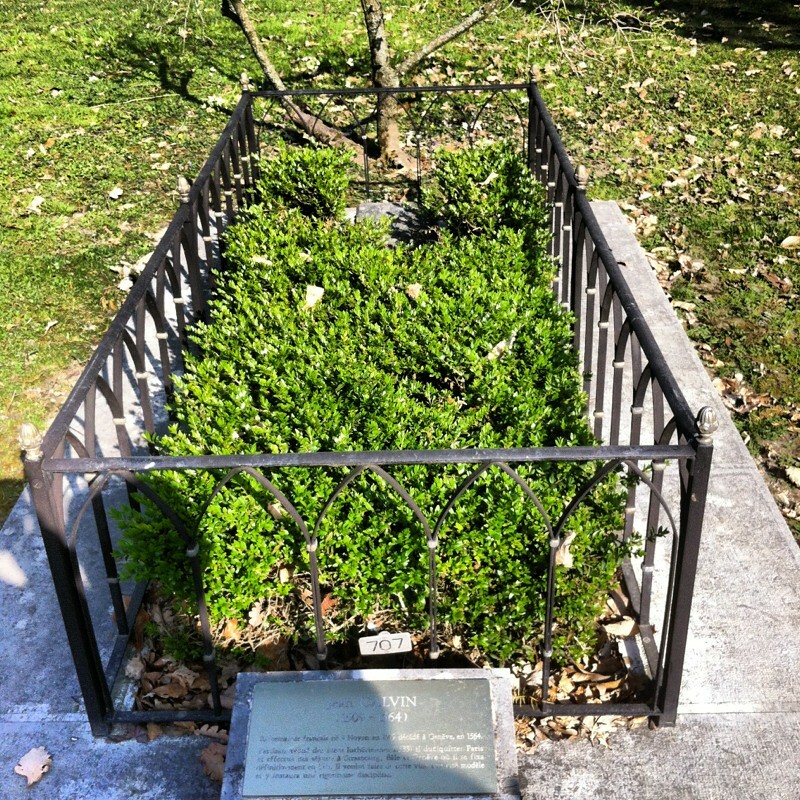 To left is the location of Calvin’s grave in Cimetière des Rois. Outside the cathedral is a sign to the Reformation museum. 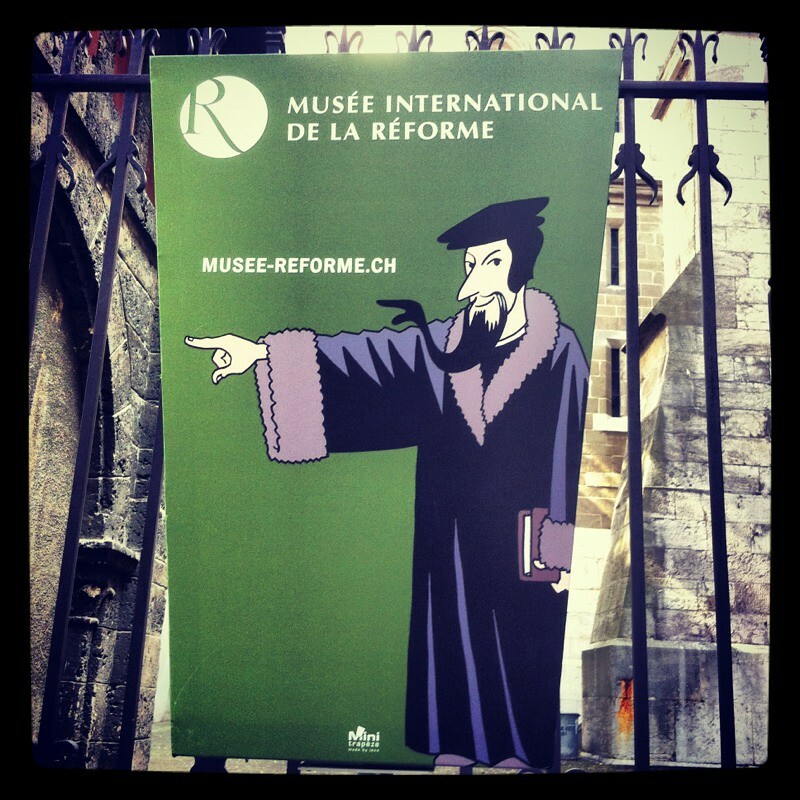 At the Reformation Museum, you can become Jean Calvin. 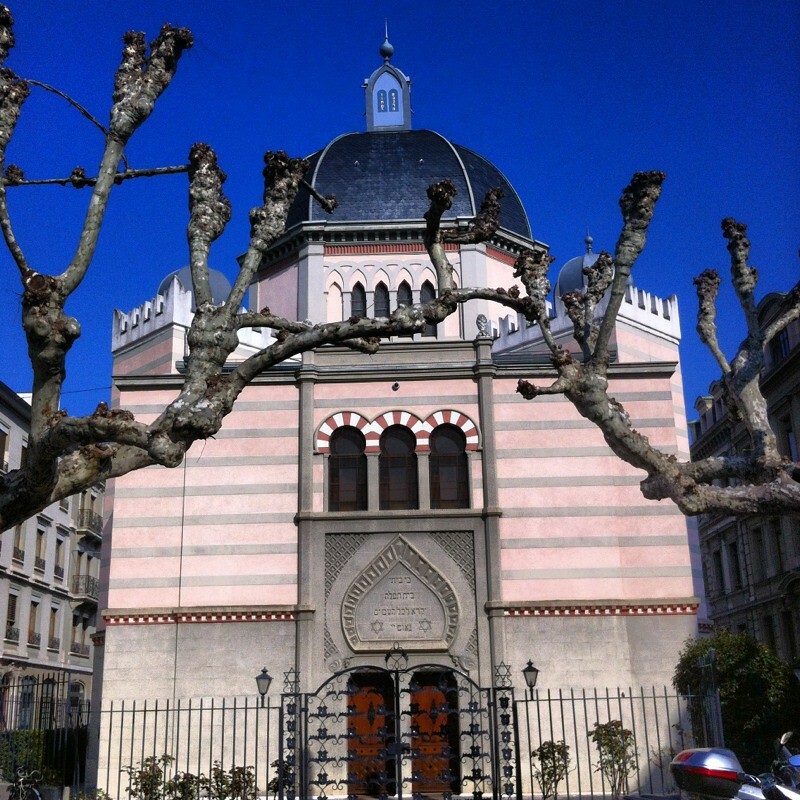 On the way to Calvin’s grave, we passed the Great Synagogue (La Grande Synagogue), officially known as Synagogue Beth-Yaacov de Genève. It was built between 1857 – 1859. 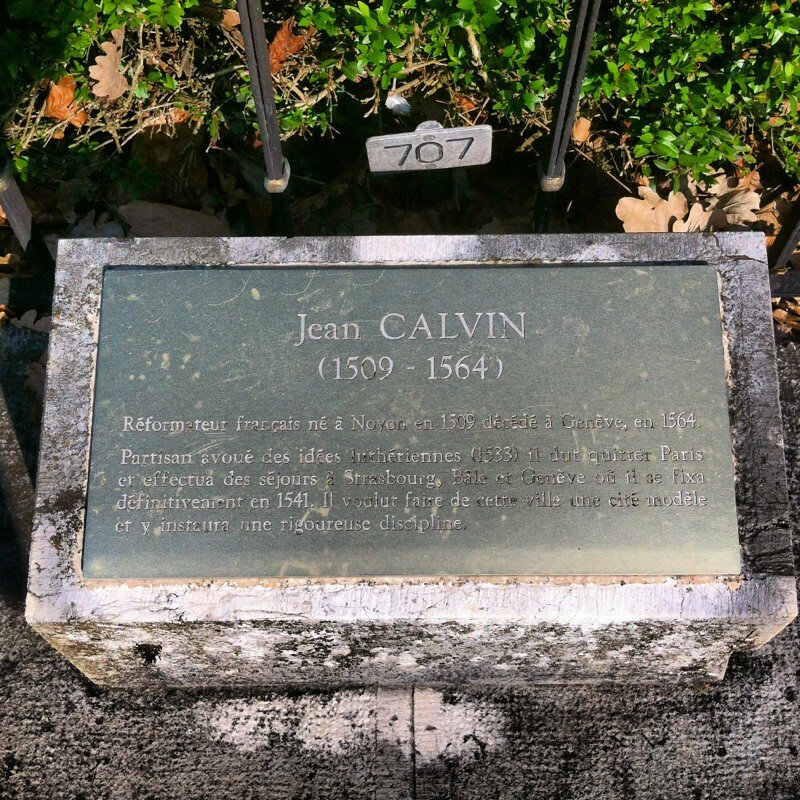 The grave of Jean Calvin. Close up of the plaque. Jean Calvin born 1509, died 1564. 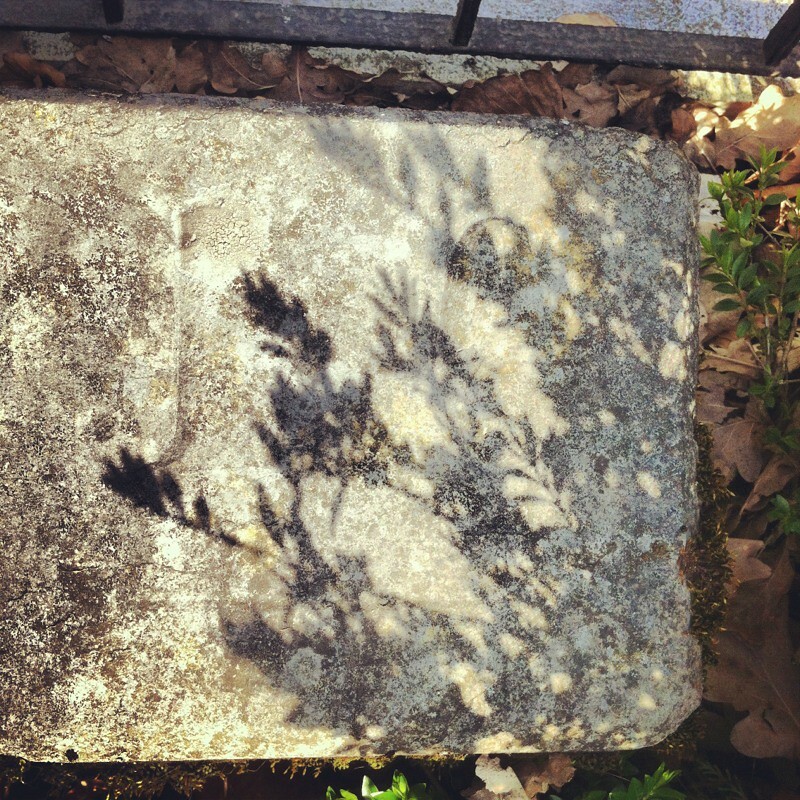 The simple marker with the letters, J.C.
Geneva is not Wittenberg. 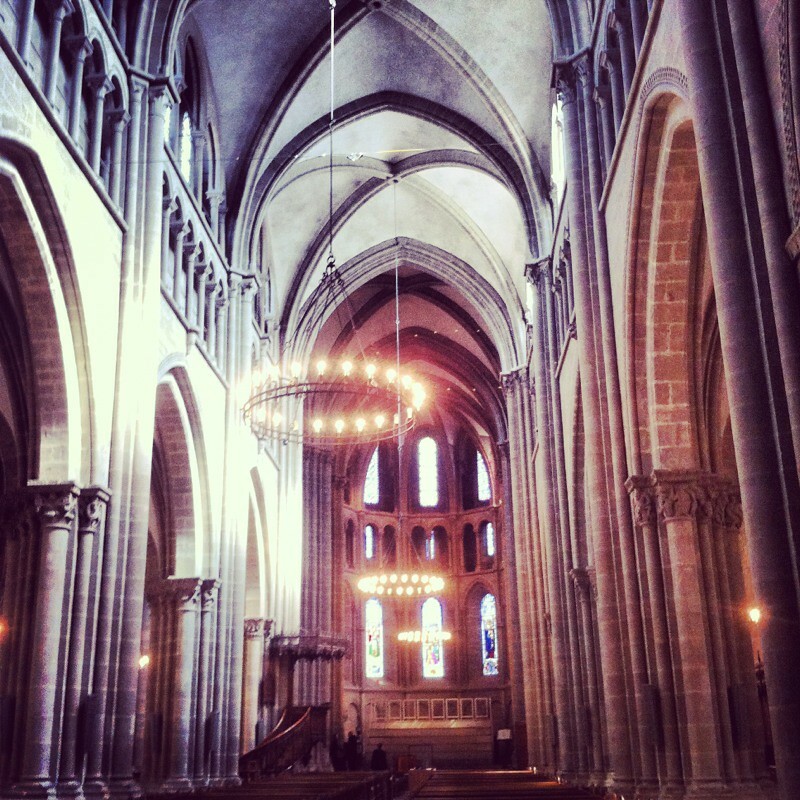 The Reformed are not Lutherans, even if some views are held in common. 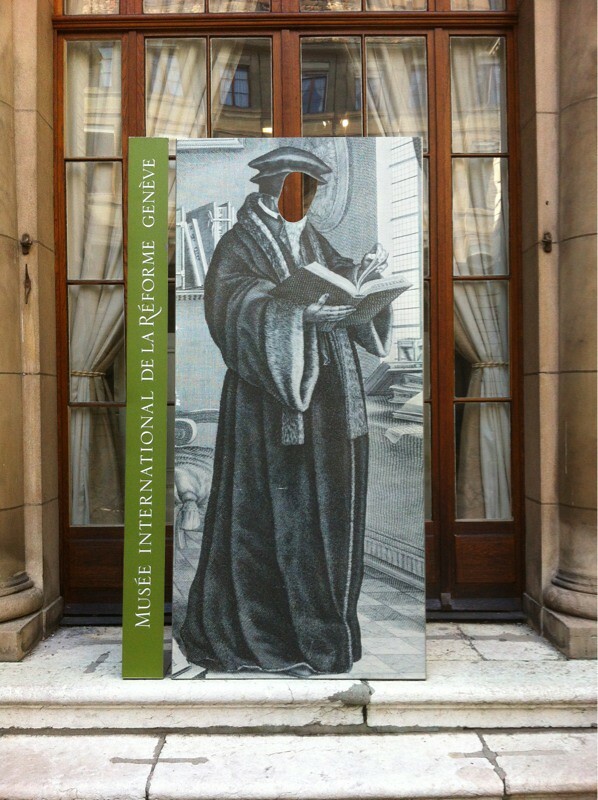 Nonetheless, the Meeting between the ILC and LWR in Geneva provided the opportunity to visit some historic Reformed Reformation Sites. Print article This entry was posted by Al Collver on March 29, 2012 at 5:24 pm, and is filed under Uncategorized. Follow any responses to this post through RSS 2.0. Both comments and pings are currently closed. Good to hear of your exploits! I have some friends in Geneva who are starting a new Confessional Lutheran Church there–in Spanish! Did you connect up with them perhaps?